I noticed on my mobile a Twitter service called Follow Cost and thought I would check it out. Follow Cost publishes a Twitter account’s average number of updates over time along with a recent updates number. As you can see below, my average Tweets per day over the life of my Twitter account has been 13.72 Tweets a day while recently my Tweeting frequency has increased to 235.45 Tweets a day. This in turn has caused Follow Cost to declare following me on Twitter to have a “Nuclear Follow Cost”. 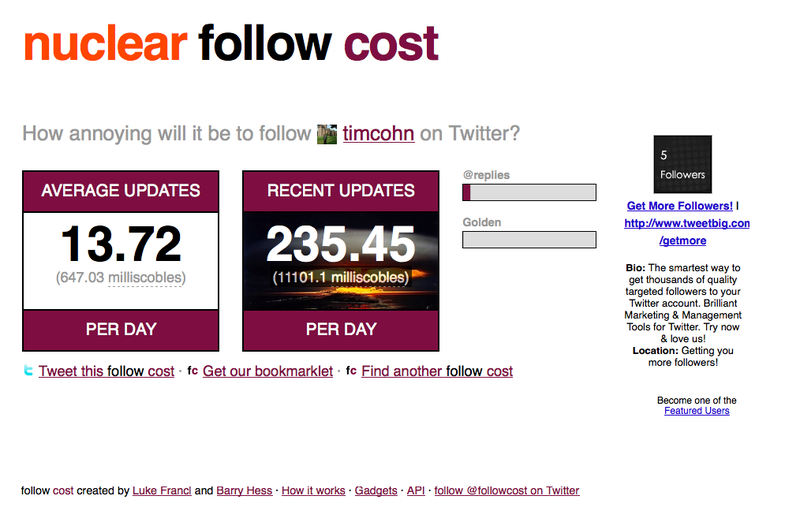 FollowCost.com measures its Twitter following costs in units called Milliscobles. With my recent updates score of 11101.1 milliscobles, I don’t whether I should be alarmed or relieved. 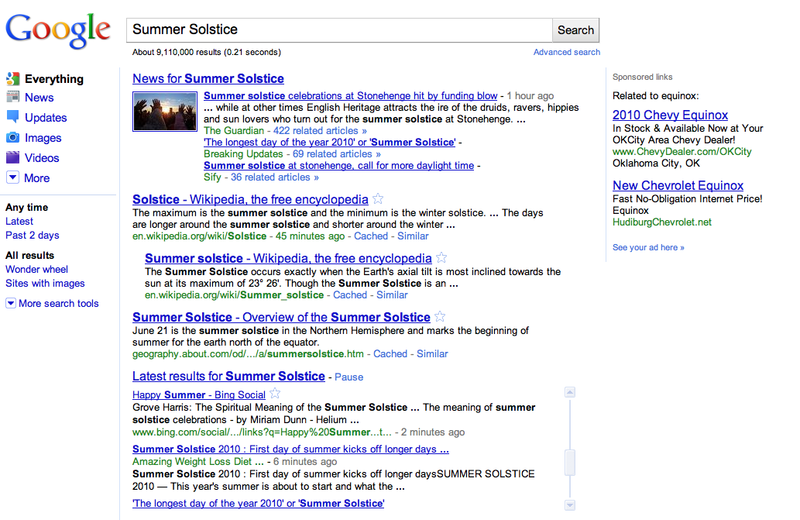 I was searching for Summer Solstice today in Google and saw a Tweet in their real time search results from “Bing Social”. 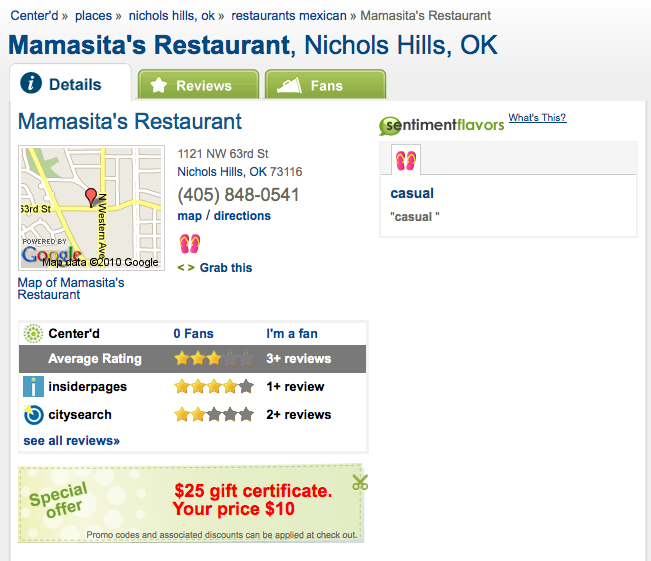 Having never heard of Bing Social, I thought I would investigate further. Sure enough, clicking through took me to the Bing Social Beta site. 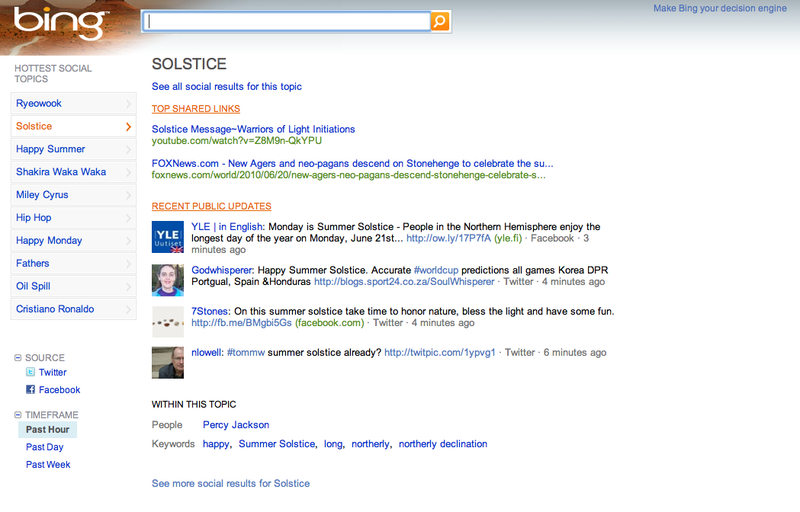 The Bing Social site is where Microsoft collects and posts the “Hottest Social Topics” from both Twitter and Facebook. While the topics featured in Bing Social may be hot, Microsoft is most likely using the social media streams to flesh out its fledgling search index. Whether the hot social topics Bing or any other search engine for that matter feature have any shelf life beyond the moment remains to be seen. If you see someone you want to follow, just click “Follow on Twitter,” log in, and they’ll be added to your following list in Twitter. This integration is based on Twitter’s new @anywhere frameworks, which make it easy for any site to add Twitter functionality. 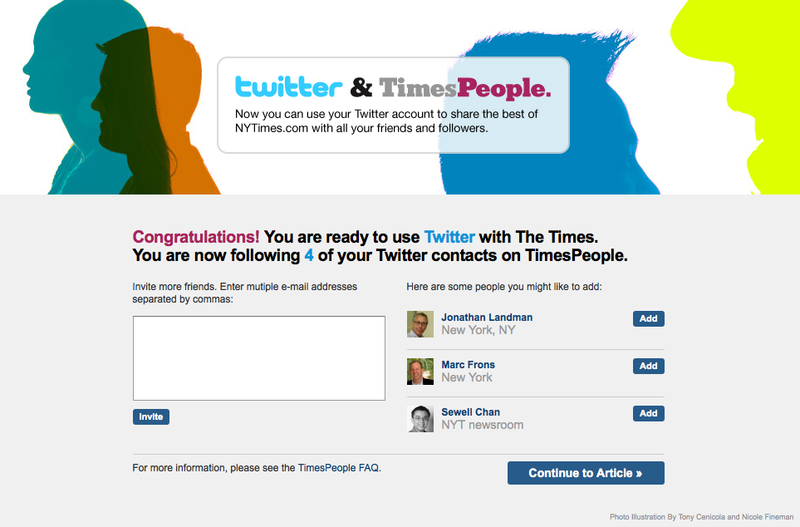 We’re using the frameworks to provide dynamic information about Twitter accounts and one-click following. From my perspective, “Find People to Follow” is a great idea executed backwards. When I logged into my Twitter account today I discovered the total number of Tweets displayed in my account were 200% greater than the number of Tweets I have actually posted. Last I recall I had around 3,500 Tweets. Based on this new Twitter stat, I guess I am now much more prolific than I was just one day ago. Yahoo News wouldn’t normally care whether its brand name was mixed in with this Twitter user’s other tweets. Yet, I am pretty sure they aren’t going to be publishing news on their new blog network featuring stories laced with curse words any time soon. Even I, a lowly rather unimaginative blogger can crank out Tweets and Blog posts free of cuss words. I guess anything goes in Web 2.0. 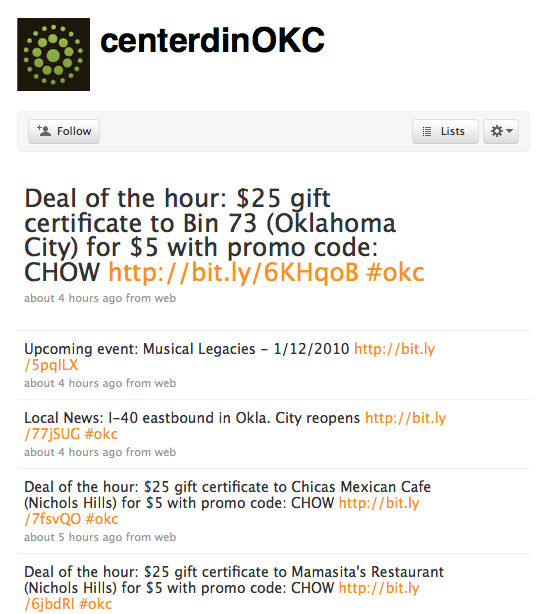 I don’t know how successful distribution and redemption of coupons / gift certificates will become on Twitter but the following is an example of a Tweet for a gift certificate, it’s landing and then purchase pages. 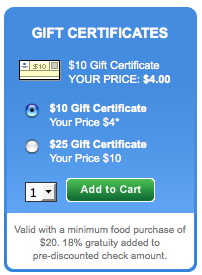 The gift certificate’s headline and promise are disingenuous because the $10 gift certificate’s $4 purchase price is only valid when used toward a minimum food purchase of $20.00. 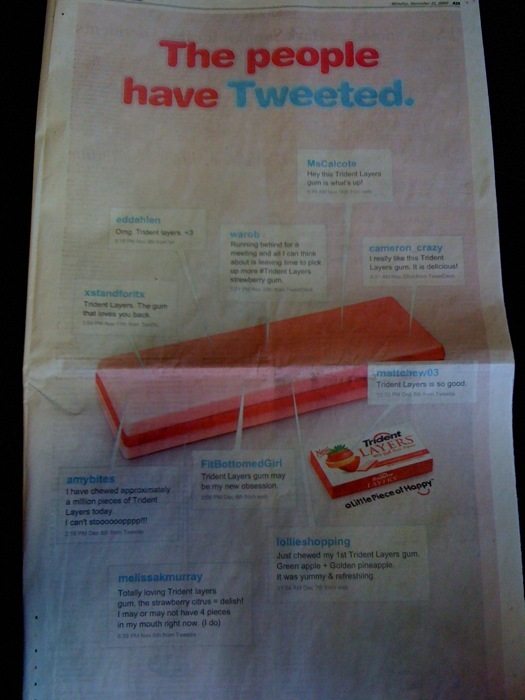 In today’s Wall Street Journal there is a full page ad from a gum manufacturer featuring Twitter Tweets as “endoresments” of their product. The ad then features Tweets that speak highly of their gum brand from ten different Twitter accounts. I wonder if Trident had to get permission from each of the Tweeters to use their Tweet in their promotional materials or if the Tweeters were compensated for endorsing Trident Layers? Time permitting, I am going to contact each of them and see if they were even aware their Tweets had been used in a full page Wall Street Journal ad or not. The following ten Twitter accounts endorsed Trident Layers gum. MsCalcote, eddahlen, warob, cameron_crazy, xstandforitx, mattchew03, amybites, FitBottomedGirl, melissakmurray and lollieshopping. I sure hope for Trident’s sake they alerted these Tweeters first (not me) about using their Tweets and that none of the above Twitterers are employees, friends or family members of any of their ad agencies. To get a quick overview of what type of Twitter user you or your friends are check out Tweeps.Info. What do they tweet about? How much do they tweet? 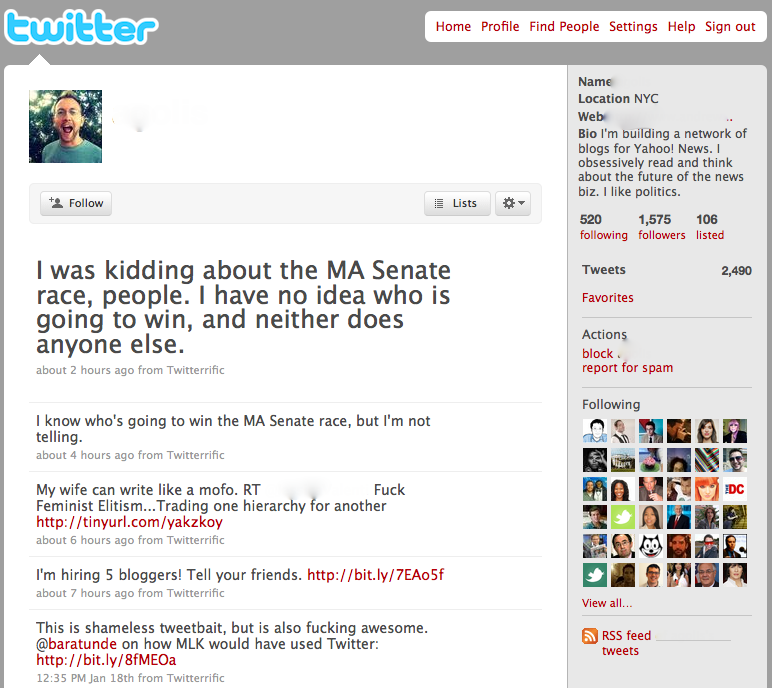 I was surprised to learn my Twitter account registered under any of their metrics. 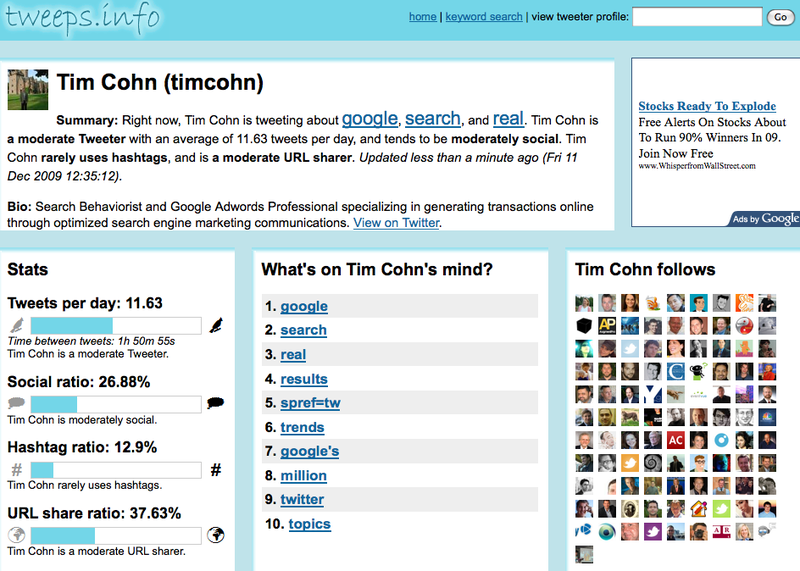 google is a keyword used regularly by 2.67% of tweeters in our tweeterbase. I guess the initial wave of Twitter spammers probably duplicated their content from one account to the next as they spammed and then their accounts were banned. Taking a page from those early Twitter spam innovators, the MLM crowd appears to have picked up where the spammers left off while also adding a few new tricks of their own. Apparently one of my previous Tweets had a keyword sweet enough in it for the Twitter search and follow autobots to follow my account. It was probably the #140Conf hashtag. This morning I received two new Twitter followers one from a man, the other from a woman one right after another. Since I don’t auto-follow followers, I went to investigate each Twitter account to see what I could find. What I found was two Twitter accounts with legitimate names and bios yet both had the same background and Tweet history. Cloned Twitter accounts Tweeting spammy duplicate MLM content! 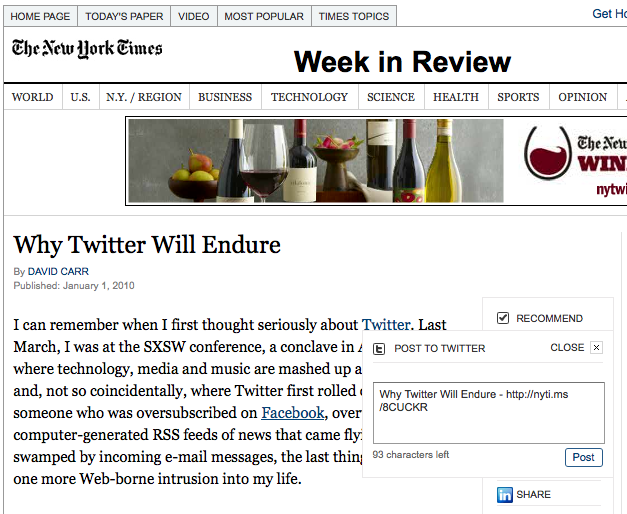 If I were guessing, I would say this could become a major hassle for both Twitter and Twitter’s audience.